The New Humanitarian | What went right in the crisis response? What went right in the crisis response? Sahelians are used to living on the edge and doing all they can to overcome adversity. In 2011, the combined shocks of ongoing high food prices, an end to remittances from Libya, poor harvests across much of the region, and conflict in northern Mali, had a disproportionate effect on the fragile food security situation and the region’s economy: An estimated 18.7 million people are at risk of hunger and 1.1 million at risk of severe malnutrition this year. Donors and agencies had been “stung” by criticisms of their late response to the Horn of Africa drought in July 2011, spurring them to respond earlier and more quickly in the Sahel three months later, said Peter Gubbels with NGO Groundswell International and co-author of Escaping the Hunger Cycle: Pathways to Resilience in the Sahel. “They avoided the worst and took early action,” said Gubbels. Early warning reports came out in October in some places; before December national governments (other than Senegal and Gambia) had recognized the early warning signals and reacted to them; and response started to scale up from January onwards. Data on who was in need and how, is much more accurate now that governments and aid agencies across the Sahel systematically carry out SMART surveys (a methodology that gives an accurate assessment of the severity of a crisis by analysing the nutritional status of infants, and population mortality rates) every lean season; and have taken on household economy analysis (HEA) which gives a fuller, more nuanced picture of how vulnerable families are thrown into crisis. “This is a major improvement on how to identify vulnerability and greatest need,” said Gubbels. HEAs in Burkina Faso for instance, identified food-insecure households in areas untouched by drought. Donors have pumped US$971 million into the region since the end of 2011; and when compared month by month to the drought response in 2010, more money came in and sooner, with big announcements from multilaterals such as the UN Central Emergency Response Fund ($80 million) and the European Union humanitarian funder ECHO in November (ECHO and the European Commission have provided $410 million for the food crisis).The USA then gave $315 million; with smaller donors such as the UK and France following suit in January. “Donors pumped in money from the beginning,” said West Africa advocacy adviser with NGO Oxfam, Stephen Cockburn. The crisis maintained a fairly high profile throughout the year: “We never had so many high-profile visits to our area over a condensed period,” said Gubbels. However, despite increased donor action, funding is still at just 59 percent of the $1.6 billion estimated needs. Many national governments led on the response, and nutrition systems are now in place in most Sahelian countries, said nutrition adviser for UNICEF, Felicité Tchibindat. Niger stands out, raising the alarm in October and using sophisticated early warning systems. It scaled up the nutrition response system that has been going since the 2010 crisis, scaled up nutrition training as part of its national nutrition protocol, and is now ahead of the game resilience-wise, says Oxfam. The country has nearly halved the death rate of under-fives since 1998. 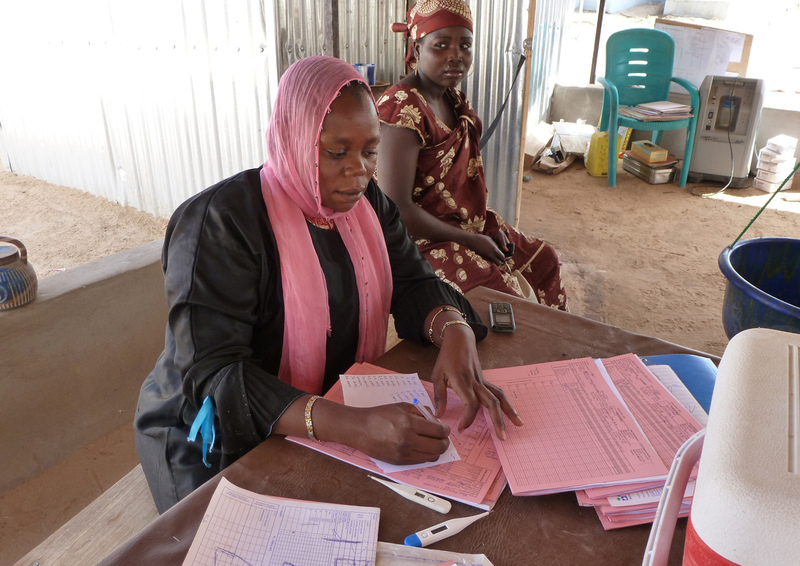 Chad has also made significant progress since the beginning of the year, taking on a nutrition protocol, setting up referral systems, and training hundreds of health workers in nutrition. Even Nigeria now accepts SMARTs, noted Tchibindat. Malnutrition stigma has dissipated: Governments that several years ago, sought to hide or gloss over malnutrition as they deemed it shameful, are now confronting it. “Nutrition, hunger and poverty will always be shaming subjects, but there is now an openness and dialogue involved,” said Stéphane Doyon, nutrition expert with Médecins sans Frontières (MSF). Niger has made the most progress, from denial in 2005, to undergo “a revolutionary change in attitude,” says Gubbels, and lead agencies in setting up nutrition research, prevention and response. Under the agreed regional nutrition response system, UNICEF is charged with supplying all ready-to-use therapeutic food (RUTF) and has an automated local production line in Niger, which has led to increased better quality control, higher production and fewer stock-outs. When RUTF supply lines work well “it means we don’t have to worry too much about them and can get on with other things,” said Tchibindat. This was the first time Niger-produced RUTF was used to feed malnourished children in neighbouring countries. UNICEF estimates some 800,000 children will have been treated for severe acute malnutrition across the Sahel by the end of 2012. “It shouldn’t be shaming to see these numbers [one million children treated in Niger since 2005],” says MSF's Doyon. “It should encourage efforts to do more,” he said, noting that Niger preserved its treatment system even in last year’s bumper harvest. “The importance of nutrition was better understood and better-applied,” said UN humanitarian coordinator for the Sahel David Gressly. With some three million Sahelian children estimated to suffer from moderate acute malnutrition (MAM), the World Food Programme (WFP) has expanded its regular food security role to incorporate the prevention of MAM, reaching 3.7 million children and their mothers with fortified supplementary food and RTUF, according to Susan Rico, WFP coordinator for the Sahel regional response. The neglect of MAM over the long term in the Sahel has been widely criticized over recent years. The supplemental food that WFP uses to address MAM is an improved version of its classic corn-soya blend (CSB). In 2010 CSB+ was created for children over two, adolescents and adults. It is less processed and easier to digest; and CSB++ was made with added milk, oil and sugar, to target moderately malnourished children under two. While attention to MAM needs to be vastly scaled up over the long-term, WFP’s efforts have already had an impact. A preliminary September WFP study in Niger said the strategy had reduced MAM where it was used. WFP distributed cash or vouchers to 2.1 million people as of the end of September, according to Rico, making it the biggest emergency cash distribution the organization has ever attempted. NGOs also stepped up cash distributions across the region. Evaluations have not yet been completed and much more analysis is needed of market conditions and the economic climate as cash transfers are scaled up, said Jean-Martin Bauer, a market analyst with WFP, but cash when used elsewhere has proved more nimble, flexible and quicker to leverage than food distributions, under the right conditions. Some of the government market interventions in response to the crisis paid off on a limited scale, said WFP’s Bauer, notably Mali removing VAT for rice sales to try to stabilize sky-rocketing rice prices; and the government of Mauritania setting up subsidized sales of rice and vegetable oil in the capital, Nouakchott, which had an impact as it was done on a large scale in an urban setting. Several countries - notably Niger, Mali, Nigeria - have large national grain reserves which help kick-start humanitarian response in times of need, as agencies can use them with a view to replenishing them when their food stocks arrive. West African states are on the right path as they have a regional agricultural policy, ECOWAP, but need to implement it, says Bauer, and take it further to create a common market policy where countries standardize import taxes on cereals, create regional grain reserves, clamp down on the region-wide racketeering that ups food prices, and take other measures to enable the region to better meet the climate and economic shocks that are inevitable in the future. WFP can now buy food on loan, paying once donor funds arrive, which speeds up procurement in some cases by up to 100 days, said Rico. Increasing regional procurement to one third of the total also sped up response. Rico estimates WFP reached eight million people with food aid or cash vouchers, which represents an estimated 80 percent of those in need. Donors are slowly understanding the importance of building resilience in the Sahel. “Due to this crisis, governments are now more open to talk about food insecurity, resilience, nutrition,” said ECHO head in West Africa Cyprien Fabré. In July 2012 the governments of the Economic Community of West African States (ECOWAS), WFP, the Food and Agriculture Organization (FAO), CILLS (Inter-state Committee to fight drought in the Sahel) and donors launched the Agir Sahel initiative (Global Alliance for resilience) to help Sahelians cope with future shocks partly by focusing more on agriculture. The UN is currently formulating its Sahel resilience strategy. And affected governments are also getting better at resilience - Burkina Faso’s government is focusing more on small-scale agriculture; Niger’s government is considering boosting social safety nets. They should look to Ethiopia for inspiration, says Gubbels, where the government has set up a system to get cash or food to seven million of its most vulnerable citizens within two months when there is a shock. “There is nothing similar in the Sahel from what I can see,” said Gubbels. There is “a lot of good will and rhetoric,” said Gressly. “But will that be translated into operations? If it doesn’t, the status quo will be maintained and we’ll be back to where we were this year,” he warned.